PLAZA – In an effort to avert the trashing of the Plaza that occurred last Halloween, the City is adopting tactics similar to those used with success last New Year’s Eve. The Plaza’s center will be cordoned off, the Arcata Police Department will have its Critical Incident Response Vehicle – the mobile commnd post RV – on scene, and APD will be augmented by officers from area law enforcement agencies. Police Chief Tom Chapman is counting on the show of force, plus alternative activities and wet weather to minimize Plaza abuse and maximize public safety. The downtown arrangement will allow APD to maintain service elsewhere in town, rather than have the Plaza consume all its resources. McKinley actually looks kind of happy for a change. He’s confident that other Halloween-night events will provide excitement sufficient to draw away those who might have aspired to climb the McKinley statue and/or dangerously carouse on the Plaza. “I’m hoping that people will look to alternatives,” he said. Chapman said lacking other solutions, the police show of force was necessary to maintain public safety. But he doesn’t miss an opportunity to restate that it is not an optimal approach. This Halloween, the Arcata Police Department encourages people to play it safe. It is anticipated there will be rainy weather this Halloween. Parents and children should carry flashlights and wear a piece of reflective clothing. For older kids, parents should set a time limit for trick-or-treating and make sure the kids go with friends. Remind kids not to enter a strange house or car. Arcata Main Street will be hosting its annual Trick-or-Treat on the Plaza from 4 to 6 p.m. Local businesses will be participating in this family-fun event. The City of Arcata will be hosting a Halloween Carnival at the Community Center from 5:30 to 7:30 p.m. This event supports the Youth Development Scholarship fund. Due to the vandalism and other criminal misconduct that occurred in the late evening hours on the Plaza last Halloween, the APD will have a zero tolerance policy on the Plaza. APD and other local law enforcement agencies will be patrolling the Plaza. After the Arcata Main Street family-fun Trick-or-Treat event ends, the center of the Plaza will be cordoned off the remainder of the evening. 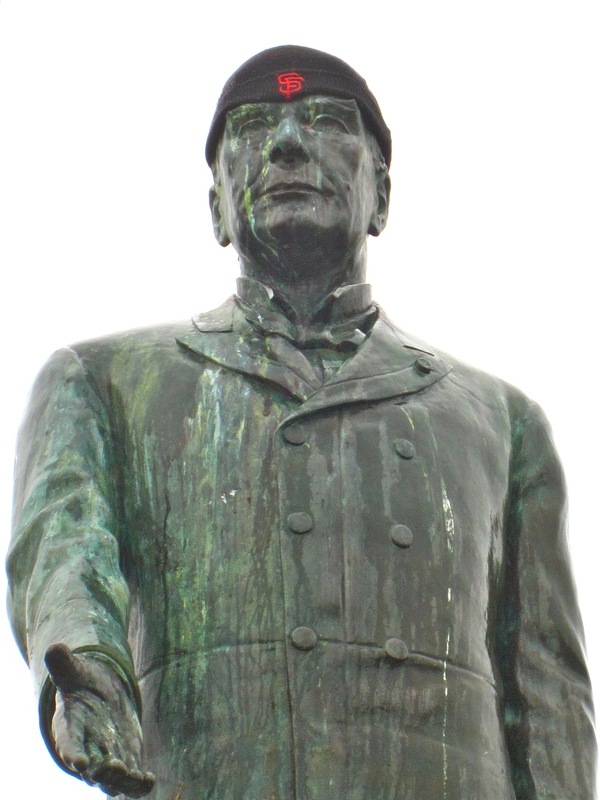 Last Halloween, the statue at the center of Plaza was vandalized with graffiti. People climbed the statue and urinated on the crowd gathered below. 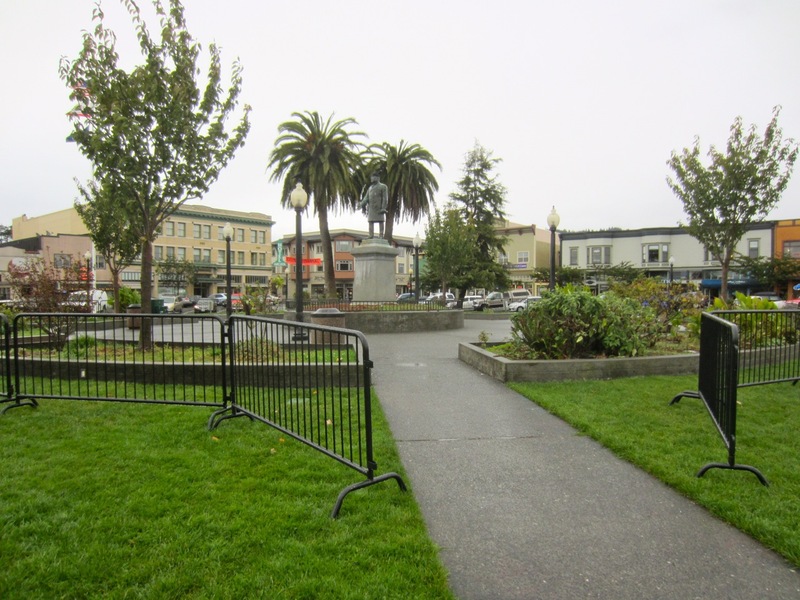 Due to the amount of destruction and trash left behind the City of Arcata had to temporarily close portions of the Plaza to clean up broken glass, trash, and other debris. The APD will curtail this behavior by enforcing a zero tolerance policy on the Plaza. There are many alternative events for adults to enjoy on Halloween, from live concerts to dancing. The APD encourages people to act responsibly, respect the community, designate a driver and have fun. This entry was posted on Wednesday, October 31st, 2012 at 12:39 pm	and is filed under News. You can follow any responses to this entry through the RSS 2.0 feed.